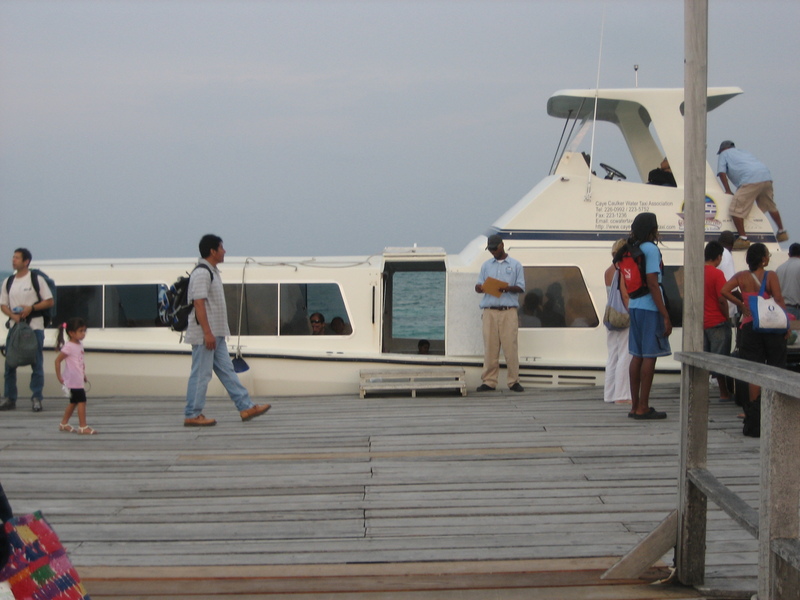 We caught the 8:30 water taxi back into Belize City Saturday morning (April 2nd); again packed in like sardines. I sat down in one of the last square feet of space while the crew took Bee up to the top of the boat where the driver sits. I have to admit I was a little panicked that they were taking my husband off of the boat, but relaxed when I realized he was climbing the ladder to the top where they had already put some people. They had another water taxi all ready to go if they needed it, but decided to make the most of the space and just take one boat. Lucky for Bee, because he had an amazing view of the Caribbean during the hour and half ride and learned some interesting things about the sugar cane industry from the captain. I on the other hand, sat between two very nice men who were about my age and also from Seattle. This would be the third time Bee claims I was chatted up (they were gay, however, so it turns out they were just genuinely nice guys). He was amazed to find out his wife can be a social butterfly. We decided that we genuinely dislike Belize City. Most people and guide books discourage tourists from spending any more time than necessary there, to which we give our hearty approval. It’s a bit scary. We were guided to the bus station by a very enthusiastic young man who, of course, needed a little tip for his helpfulness. We would have had a hard time finding the bus station without him, because Belize doesn’t really believe in road signs. 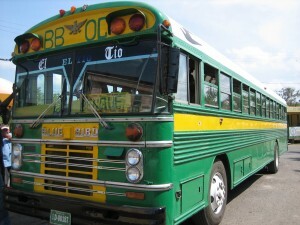 One of the public buses. At the bus station we were helped by yet another very nice young man who works as a porter (possibly self-appointed). He helped us get on the right bus and put us at ease a little bit. He also needed a small tip. 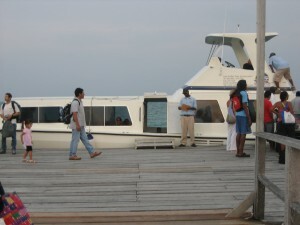 You don’t buy tickets for the bus in Belize. Each bus has a conductor who comes around to each of the passengers and collects their fare while the bus is traveling and the price depends on where you’re going. We were amazed by the memory of these conductors. Without fail, they knew exactly who they had already collected from and who was new on the bus and still needed to pay. Sometimes they would wait five or ten minutes after picking up new passengers to walk down the aisle and collect fairs. There aren’t really designated stops along the route – people would just tell the driver when they wanted off and he would stop anywhere along the way to pick up passengers. The buses are old American school buses that they paint in bright colors. It was a three hour ride from Belize City to San Ignacio in an unconditioned bus packed full of people on a 90 degree day. Thankfully the windows were open and Bee and I got to sit together. We arrived in San Ignacio in the early afternoon and were immediately offered a taxi ride to our hotel, which Bee immediately accepted. I would have preferred to look at the map in the guide book and walk the ten minutes to our hotel, but Bee didn’t realize I could have figured out where we were going. As a side note, we learned a lot about each other on this trip. Bee learned to trust in my preparation, planning, and research, and that I can talk to strangers to get the information I need on the spot. I learned that he needs some time in a new place to let everything sink in and adjust to new surroundings. Once we had that figured out we discovered that we make a really good traveling team. 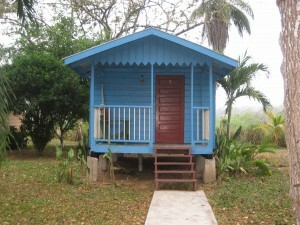 We stayed at the Midas Tropical Resort in San Ignacio for the next six nights in a cute little blue cabana, again with air conditioning. Before you jump to any conclusions, this was not a high-end resort, but it was quaint and quiet and the people were really nice. 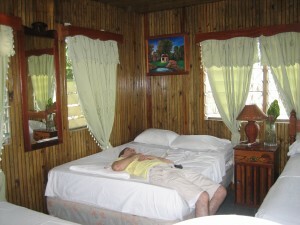 We could have stayed at a more expensive fancy place, but who wants to do that? For $65 a night we had everything we needed, and some fun memories. The hot water was heated on demand, which meant that you had to wait at least 5 minutes for anything remotely resembling hot water and then all of sudden it was really hot and you had to do some fancy adjusting to get it to a temperature that wasn’t scorching. Then all of a sudden it would turn cold again for a few seconds. Sigh. Bee wasn’t usually patient enough to turn the water on and just wait, so he sometimes took cold showers then I jumped in and had hot water. We’re a pretty good team, right? It had been a long day of travel. So after we checked into our room on Saturday we walked back into town to buy drinking water and ended up booking two tours for the next two days. I was looking at the guide book to figure out where to eat and a guy stopped to give us directions. Turns out he works for a small tour company and he likes to talk. His name is Mercedes, but everyone calls him Rudy. We saw quite a bit of Rudy. He gave us an excellent recommendation on where to eat dinner, and it turned out to be the only place we ate at in San Ignacio (Hode’s Place). It was two minutes from our hotel, clean, and the food was really good. In Belize, you eat outside at just about any restaurant you go to. Hode’s Place had a huge outdoor covered eating area with a playground for the kids. It was obviously a favorite hangout for the locals.